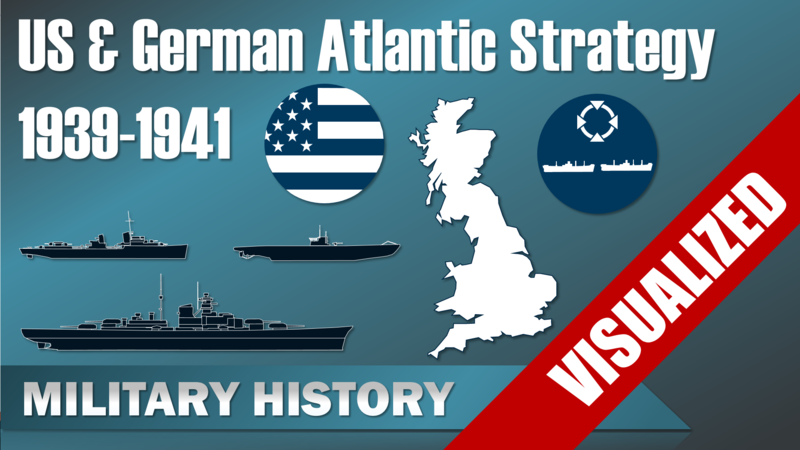 Time to take a look at the overall Strategy in early World War 2 concerning the Atlantic. This video will cover the views, actions and development of the German and American side from the time of the outbreak of the war to the situation just before the German declaration of war against the United States. So let’s get started. Raeder tried several times to convince Hitler of the “Atlantic nature” of the war. After all, Great Britain was dependent on imports and those came to a large degree from the United States, which was likely to intervene if the United Kingdom was under serious threat. For Germany the situation in October 1941 was quite difficult, the Army was still heavily engaged with the Soviet Union, the incidents with the United States further increased the support for the British and the situation in the Mediterranean was endangering the Alliance with Italy. In order to solve the crisis German submarines were ordered there. After all the loss of North Africa would expose Italy. This showed already how over-stretched the Axis capabilities were in late 1941. Hitler still believed he could beat the Soviet Union and that the Mediterranean was central for stabilization of continental Europe. He assumed that Italy could easily collapse, thus he focused on improving German naval and air units in the Mediterranean. Naturally, the Navy and Hitler had a different approach, the Navy wanted to take clear stance against the escalation by the United States early on, whereas Hitler tried to deescalate as long as possible, in order to prevent a three front war before defeating the Soviet Union. Now, the British didn’t got mentioned a lot in this video, mainly due to the fact they became the junior partner of the United States and most of the initiative on a strategic level was either determined or dependent from the United States. Of course the British still did most of the fighting in this period, but this will be part of another video or probably video series. Finally, the United States with Roosevelt was a constant escalation course which is usually called “short of war“-policy. Roosevelt was mainly held back by three factors, the relatively unprepared US forces, public opinion and of course the US congress. Yet, by Mid October 1941 the public opinion was already in 70 % in favor of defeating Hitler than keeping out of the war. Still, congress wasn’t willing to support a declaration of war. (Rahn, Werner: Der Seekrieg im Atlantik und Nordmeer, in: Das Deutsche Reich und der Zweite Weltkrieg – Band 6 – Der Globale Krieg. S. 293-295) The attack on Pearl Harbor by the Japanese and the following declaration of war from Hitler against the United States clearly changed this situation, the Second World War was set in full motion by the end of 1941.